Asphalt is 100% recyclable and the recycling process doesn’t emit greenhouse gases. It actually benefits the industry to recycle asphalt. 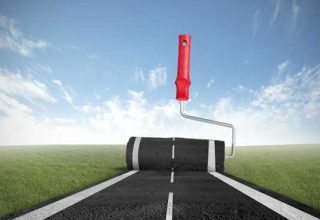 Asphalt is also inert and doesn’t release any harmful gases or materials to the environment. These aspects make this material environmentally friendly and sustainable, reducing costs and the carbon footprint. Laying down asphalt pavements doesn’t take a lot of time. This is because of the fact that, unlike concrete, asphalt doesn’t require curing time. In most cases, vehicles can travel on these roads almost immediately after the construction is done. This saves a lot of time and money. Asphalt roads are very easy to maintain as opposed to concrete roads and other alternatives. Any potholes, cracks, and problems can be immediately addressed and quickly solved. The repaired piece of road meshes smoothly with the original surface. As with construction, the pavement repair doesn’t take much time either. The road can be used immediately afterwards. As we mentioned before, the porous asphalt surface drains the water and directs it to the ground underneath. This ensures that water isn’t accumulated on the surface. The road surface texture is also specifically designed for better grip. If the aggregate mixture is accurate, the texture will be rough enough for the tires to grip it easily. This ensures that regardless of the weather, the asphalt road is relatively safe to drive on. According to research, an asphalt road produces 50% less noise than a concrete road. Moreover, the porous asphalt road further reduces the noise levels by 50%. This can contribute to a better overall driving experience and reduces the stress endured by the driver. There are several other benefits of using asphalt. It’s more affordable, it’s durable, and very versatile. Most people don’t regret their choice if its asphalt.